Scientists have identified thousands of previously ignored genetic mutations that, although rare, likely contribute to cancer growth. The findings, which could help pave the way to new treatments, are published in PLOS Computational Biology. Cancer arises when genetic mutations in a cell cause abnormal growth that leads to a tumor. Some cancer drugs exploit this to attack tumor cells by targeting proteins that are mutated from their usual form because of mutations in the genes that encode them. However, only a fraction of all the mutations that contribute significantly to cancer have been identified. Thomas Peterson, at the University of Maryland, and colleagues developed a new statistical analysis approach that uses genetic data from cancer patients to find cancer-causing mutations. Unlike previous studies that focused on mutations in individual genes, the new approach addresses similar mutations shared by families of related proteins. 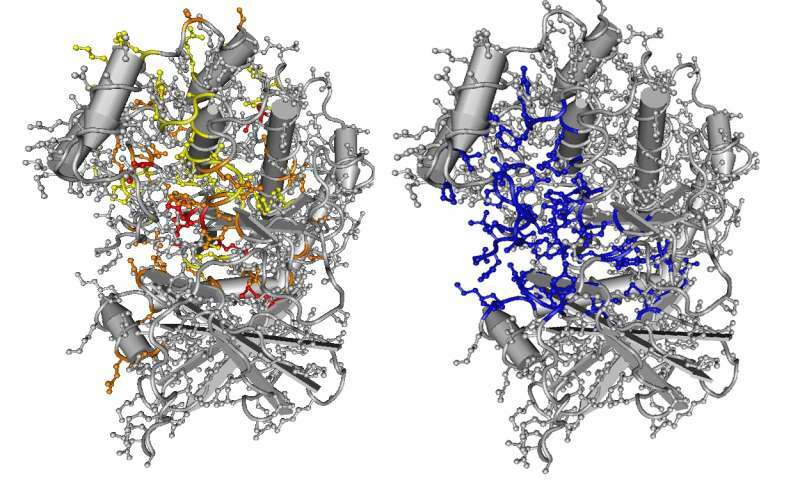 Specifically, the new method focuses on mutations in sub-components of proteins known as protein domains. Even though different genes encode them, different proteins can share common protein domains. The new strategy draws on existing knowledge of protein domain structure and function to pinpoint locations within protein domains where mutations are more likely to be found in tumors. Using this new approach, the researchers identified thousands of rare tumor mutations that occur in the same domain location as mutations found in other proteins in other tumors— suggesting that they are likely to be involved in cancer. "Maybe only two patients have a mutation in a particular protein, but when you realize it is in exactly the same position within the domain as mutations in other proteins in cancer patients," says senior author of the study Maricel Kann, "you realize it's important to investigate those two mutations." The researchers have coined the term "oncodomain" to refer to protein domains that are more likely to contain cancer-causing mutations. Further study of oncodomains could help inform drug development: "Because the domains are the same across so many proteins," Kann says, "it is possible that a single treatment could tackle cancers caused by a broad spectrum of mutated proteins."